He served as the City’s 785th Mayor for 2007-2008 following his term as Sheriff of the city. Born in Southampton in 1957, Councillor Barnes-Andrews was Educated at Foundry Lane School, Bellemoor Secondary Modern and Richard Taunton’s College. He attended London University and obtained a law degree. 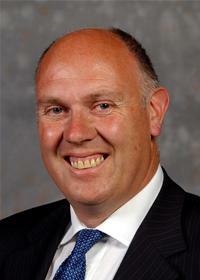 Councillor Barnes-Andrews has worked for British Homes Stores, Wilton Royal Carpets and since 1990 he has had various management positions with Waitrose. Councillor Barnes-Andrews was elected to the Council in 1994 for Freemantle ward, since 2003 he has represented Bevois ward. He has held various positions in the City Council including Chair of Football Stadium Panel, Chair of Leaders Scrutiny, Chair of Resources Scrutiny Panel, Cabinet Member for Corporate Services, Appointed Chair of Overview and Scrutiny 2010/11 and 2011/12 and Shadow Spokesperson for Safeguarding Children 2009/10. Councillor Barnes-Andrews has also represented council on various outside bodies including the Gantry Board, City College and Airport Consultative Committee.